I had a tough day yesterday. 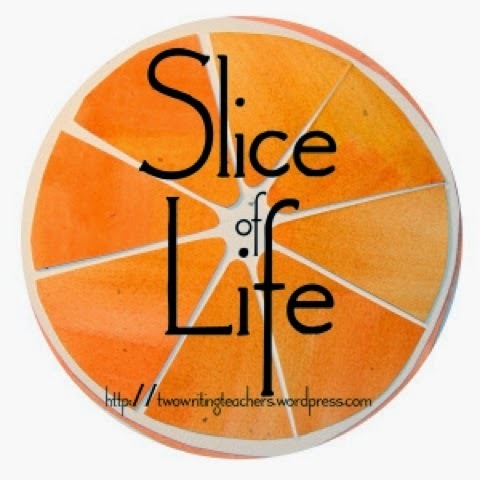 I wrote about it in my Slice. I needed to write to get my head on straight. As I had predicted in the morning, with the perspective of many hours later, I was feeling better, but I still posted it. I wasn’t sure what the response would be, if anything, but I hadn’t done it for that, I’d done it for myself…to work it all out in my head space. And since Slicing is all about sharing your truth through your writing, I knew I needed to go with what were my honest thoughts. I hit submit on my post as I was walking out of school (since I drafted it as I was modeling for my students in class). By the time I got home ten minutes later, I already had several comments and a text message from a friend. As I was responding to my friend who was concerned, I started getting twitter direct message notifications – another friend was worried. As the evening went on, messages and comments continued, and I started to realize something. I didn’t even know what I needed yesterday when I wrote what I did – I just knew that I needed to clear out my head a bit by putting the swirling thoughts onto paper (screen) so they were out of my head and I could focus on what I needed to do throughout the day to teach the students in front of me. But what I really needed was to know there were people who understood. I don’t think I even knew the depth of the community I have built over the years through my twitter PLN and the edufriends I have made there. I realized that they have become some of my truest friends, not only because they understand what I do professionally, but because they are some of the most caring, supportive people I know. I needed their support even though I didn’t know it at the time. But throughout the evening, as the messages came in, the encouragement and understanding I got from those friends helped me immensely. It reminded me that I’m not alone. I didn’t even know what I needed yesterday, but my friends gave me what I needed anyway, even if I didn’t know to ask for it. They were there for me, sharing realizations from their own lives, letting me know they were thinking of me, making me laugh, being my cheerleaders, reminding me of who I am and what’s important. I am so very grateful for that. I'm so glad things are going better and that you cleared things out in your head and talked it through! Writing releases a lot. I'm glad you found solace in writing and then sharing. I know that wasn't your original intent as you posted your slice yesterday, as you mentioned that you didn't know what you needed .... until messages arrived from every which way! How awesome is that feeling? I hope your situation improves and your thinking will guide you into making the right decisions for yourself and your future. :) Hang in there. Sometimes writing is a cathartic release when our hearts and minds are full. Hope your day is going better! Well, that's why it so important to find communities, isn't it? Writing is especially hard because it is so personal. The gift of this particular community is that it is so receptive to the idea of nourishing and encouraging writing. It helps to put things down in writing, just to get our minds clear and to put things into perspective. This is a tremendous community of caring people who can feel your pain and anguish. I pray that your situation will improve. I had that same kind of day and didn't have the strength to do it the day it happened. Perhaps I'll be able to tonight. Lucky us to have this community. It's moments like the ones you described above that remind me why it's so important to show our students that writing is so much more than dumping a mediocre five paragraph essay into a Word document. Writing helps us come to know ourselves in a way we couldn't otherwise. Thank you for sharing yesterday.